Here's our review of "We Fed an Island." As much as I like the story behind this book, I can’t say I loved the telling of the story. Don’t get me wrong. José Andrés is an amazing man who spent a great deal of time and money helping the people of Puerto Rico. He deserves the accolades and attention he’s receiving, and his story is full of heart and kindness. But the book is told in numbers and facts. The mission to feed Puerto Rico in the aftermath of tragedy certainly took a great deal of planning and organization. It was an overwhelming issue that, because of a bureaucratic and political agenda, wasn’t being solved by those that should have been solving it. That piece of the story is very well-documented in the book. In fact, reading that part of it makes the plight of those that survived the storm that much more heartbreaking. But after that, the story gets straight to the point of sharing exactly how the relief efforts played out -- from which restaurants helped and which federal agencies refused to help. This is important information, but the situation was ever-changing, so following these details was difficult (though not as difficult I’m sure as following it was in real-time, in the midst of a state of emergency). I’d have preferred Andrés to have focused on personal stories and how the World Central Kitchen helped individuals and villages find food and water using their strategic planning and cooking capabilities. Though, even so, you have to marvel at just how much his team accomplished. As I said before, they truly deserve the praise they’re receiving. Even now, in the midst of the recent government shutdown, Andrés and his team continued the large-scale mission they pulled off in Puerto Rico to assure that those that were furloughed were fed until the federal shutdown ended. Though the book wasn’t exactly what I was expecting, I have hope that maybe by outlining exactly what he and his team did to feed the island, others will follow his playbook should other disasters arise. 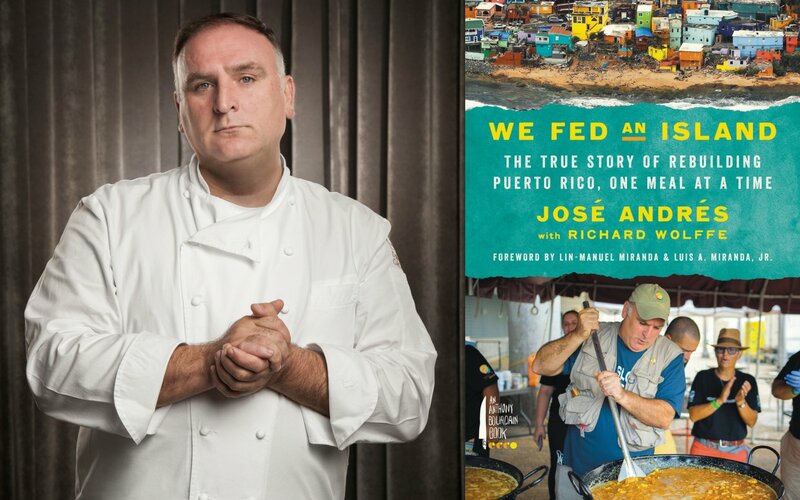 We could definitely use a few more José Andréses and World Central Kitchens in the world! HERE ARE MY RESPONSES TO OUR BOOK CLUB QUESTIONS. I HOPE TO HEAR SOME INSIGHT FROM YOU, TOO! 1. Lin-Manuel and Luis Miranda wrote the foreword to this book. If you were writing a book about your life, who would you want to write the foreword (provided Lin isn’t available)? As a "Hamilton" super-fan, I have to say that Luis and Lin-Manuel Miranda would have to be at the top of my list. They are pretty incredible, and let’s not forget that Lin-Manuel Miranda is a pretty amazing writer. However, if they weren’t available, I’d say (even though it’s now impossible) Anthony Bourdain. He was one of the best writers I’ve ever read, and if he were writing the foreword, it would mean I’d have had lots of adventures in food and travel to be proud of! 2. In the age of celebrity chefs, many of these giants are using their talents for good, just as José Andrés has. Are there any other chefs or giants of the food industry that you admire for their work to help others? I’m a big fan of Tom Colicchio and his work to bring healthy school lunches to children. He works for and speaks out about the importance of teaching kids to eat healthily. I also really enjoy Rick Bayless and his work to share his love of Mexico and Mexican culture with the masses. He fell in love with the country decades ago, and has worked since then to share what he knows about the culture with those that enter his restaurants. 3. In interviews, Andrés has said many times that he knows food, but wasn’t sure how to go about helping others with his talents. What is one talent that you have that you could use to help others? As Chef Andrés has proven, it only takes a little imagination and some will-power to change the world for the better. As a former teacher, and current instructional designer, I’d love to use what I’ve learned to teach in disadvantaged schools. I’d want to teach reading and writing to little ones and show them how exciting it can be! The answer is No, I haven’t eaten at his restaurants. And to be honest, I feel like I may need to turn in my foodie card because of it. Did you read We Fed an Islandwith us in January? Roll call! Let us know in the comments! We want to get to know you! As always, if you have a favorite DMV author or a great book that’s set in the area, comment away, or send us an email! We’re always looking to discover new and wonderful writers! **Featured image courtesy of Parade. Check back on Tuesday, February 5, to find what we're reading next!